A typed letter from Theodore Roosevelt to former Mandan mayor Henry Waldo Coe features President Roosevelt's signature. 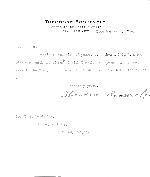 The letter, dated December 22, 1914, chastises Coe for not contacting him when he was visiting the area. The two men met and became friends while TR in North Dakota. Roosevelt served as a deputy sheriff for Morton County during his years ranching in the Badlands. The letter is on loan from the collection of a MHSoc member. A original 1904 state map of North Dakota displays Morton County boundaries after the western portion was parsed out to become Stark County. The map is displayed within a white matted antique reproduction frame.